This is Part 7 of our Maui Food Adventures! Check out the rest! 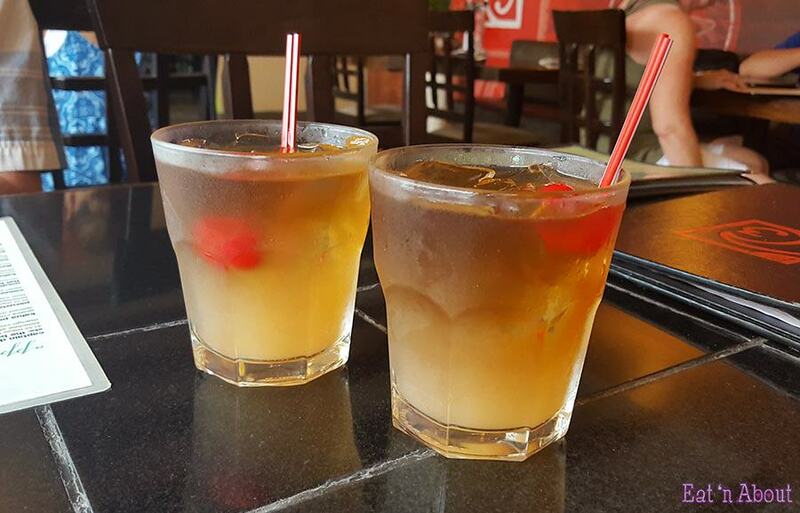 We wanted to go Happy Hour hopping one day and after walking around and checking out menus for a bit, we decided to try out the happy hour food and Mai Tais at Three’s Bar & Grill. Right away we ordered some Southside Mai Tai‘s ($3.50USD). They were boozy and hit the spot on a hot day. We actually had plans to meet up with some friends for dinner later, but still we couldn’t pass up ordering some happy hour food as they were such a good deal! First we got one each of their Peruvian Pork and their Coconut Crusted Fish Taco ($3.75USD each). 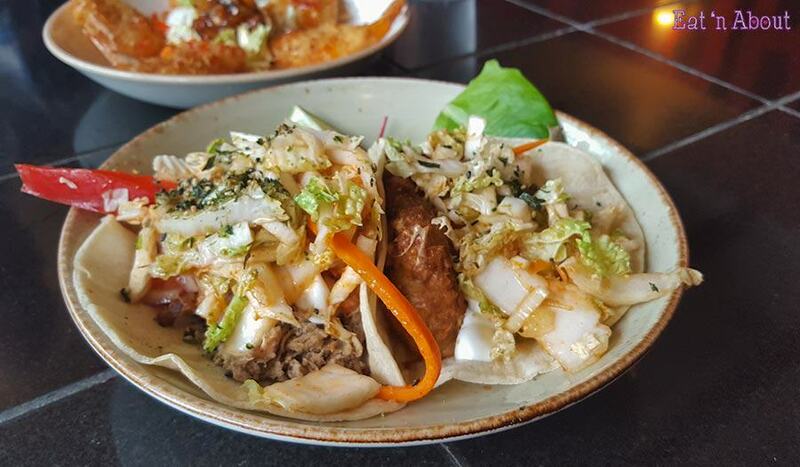 Both tacos had the same topping of kimchee slaw, big island papaya salsa, sour cream, and furikake (a Japanese mixture of seasoned seaweed and sesame seeds). The tacos were both very good. Both the pork and the crispy fish were moist and flavorful. Slaw was crunchy and the bits of papaya added a nice sweetness. However the star of the show was the Coconut Crusted Shrimp ($7.50USD) for me. It was served with an Asian peanut slaw and chipotle fruit relish. Each shrimp was battered very thoroughly and evenly and fried to a perfect crisp. 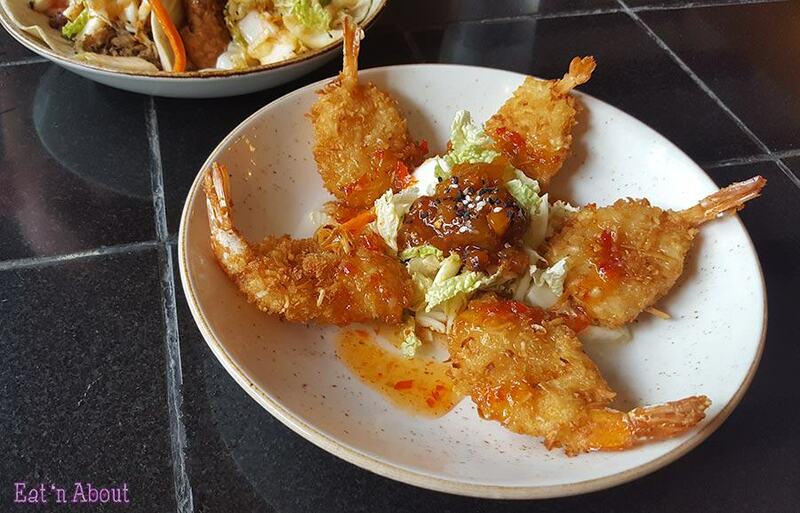 The coconut was slightly sweet and the shrimp retained their “bounce”. 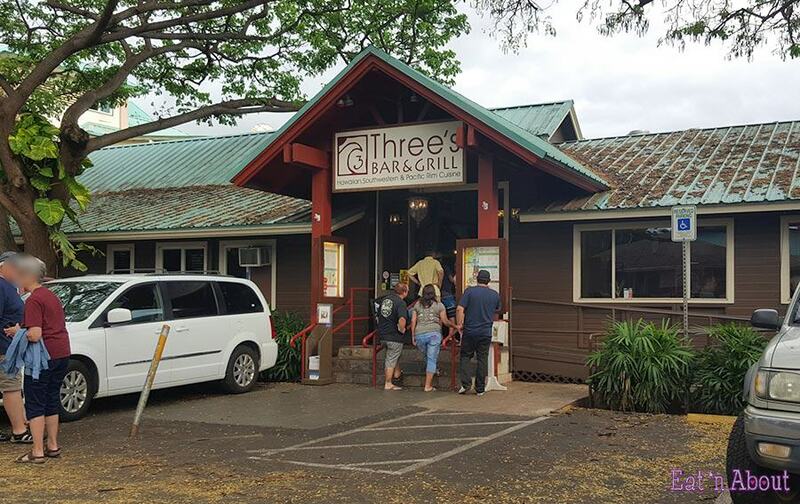 We really enjoyed the happy hour menu here and it was a great deal! Would love to revisit when we come back to Maui.